I wanted to let y'all know that our wonderful Bingo Bunny has passed away. We adopted him so many years ago and he added so much to our lives! From sleeping on the dog bed with our Great Dane (the dog would get up and move over sometimes like the bunny needed more room and the bunny was smaller than the Great Dane's head). 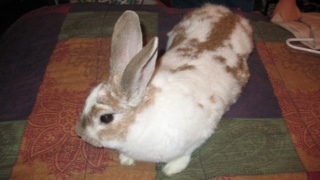 Bingo was housebroken and loved to surprise people as he hopped through the house. 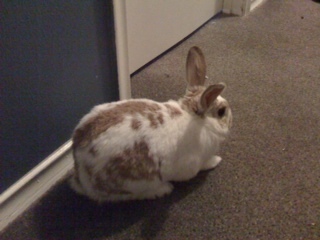 A plumber one time asked "what was that" and I explained that it was our indoor bunny and he had no idea that a bunny could be housebroken and trained. He loved to go to schools and teach the children about rabbits. He never missed a chance to be held or pet while watching TV or just hanging out. He will be greatly greatly missed.